There are over 100,000 babies born with hearing impairment in India every year. If not detected at an early stage, it can seriously impede speech, language and cognition. However, in Delhi, the Sohum team has come up with a diagnostic device to facilitate the routine screening of newborn babies – with the potential to help children at a key stage of their development. 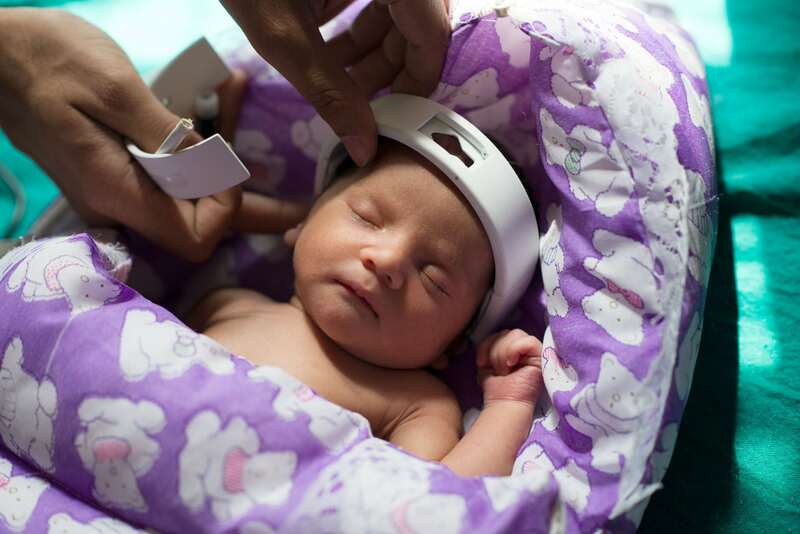 The inexpensive and portable Sohum Hearing Screening measures auditory brain waves via three electrodes placed on the baby’s head. When stimulated, they detect electrical responses generated by the brain’s auditory system. If there is no response, the child cannot hear. The battery-operated device is non-invasive, which means babies do not need to be sedated, which is the current, and risky, testing in process at present. Another of the device’s major advantages over other testing systems is the patented, in-built algorithm that filters out ambient noise from the test signal. This is important because health clinics can be incredibly crowded and noisy. The device has been installed in five clinical centres who are currently running the hearing screening program. The aim is to screen two percent of hospital-born babies in the first year, before scaling up. The project has ambitious plans – to help every baby born in India be screened. Gaby is a wildlife documentary producer with broadcast credits on BBC, National Geographic, Discovery and PBS.